***Number too small to report. 1Statistics Canada Catalogue no. 82-624-X. Food insecurity in Canada. 2015. http://www.statcan.gc.ca/pub/82-624-x/2015001/article/14138-eng.pdf – accessed May 21, 2017. 2Statistics Canada. Canadian Community Health Survey, Cycle 2.2, Nutrition (2004): Income-Related Household Food Security in Canada. https://www.canada.ca/en/health-canada/services/food-nutrition/food-nutrition-surveillance/health-nutrition-surveys/canadian-community-health-survey-cchs/canadian-community-health-survey-cycle-2-2-nutrition-2004-income-related-household-food-security-canada-health-canada-2007.html?=undefined&wbdisable=true -accessed November 12, 2017. 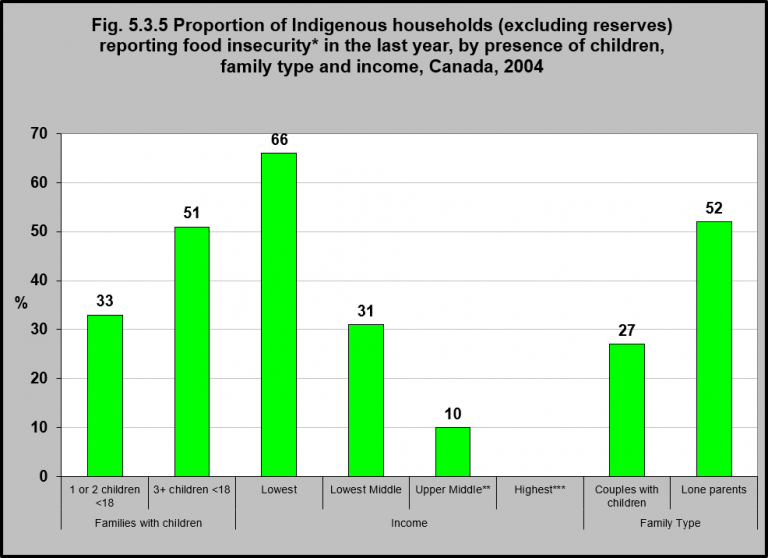 In 2004, according to data from the Canadian Community Health Survey, 66% of Indigenous households in the lowest income group had food insecurity, as did 52% of lone parent households and 51% of households with 3 or more children under 18. As food insecurity is associated with poverty and low income, any circumstances that increases the risk of poverty will contribute to food insecurity. In particular, lone parent households, especially those headed by women, are more likely to be low-income and depend on social assistance.3 Likewise, the number of children in the household can also impact food security, especially in lone-parent situations whereby caregiving responsibilities may take wage earners fully or partially out of the labour force or when there are the added costs of out-of-home care that must be paid to enable caregivers to earn a living wage. Indigenous families are more likely than non-Indigenous families to be lone parent families (which are primarily led by women), and due to higher fertility rates for Indigenous women4, children comprise a greater proportion of the Indigenous population as compared to the general Canadian population.5 These factors are contributing to increased risk of food insecurity in Indigenous families. 3Che, J., & Chen, J. (2001). Food insecurity in Canadian households. Health Reports, 12(4), 11-22. 4Arriagada, P. (2016). First Nations, Inuit and Métis women. Ottawa, ON: Statistics Canada, Catalogue #89-503-X. 5Kelly-Scott, K., & Smith, K. (2015). Aboriginal peoples: Fact sheet for Canada. Ottawa, ON: Statistics Canada, Catalogue #89-656-X2015001.